As local residents, the general public and politicians attempt to comprehend the unfolding events of the last few days one of the most striking - if not unsurprising - points of reference has been the actions of the "Mob". As a case in point, the following are just a few of the headlines which have appeared across the media in response to the London riots. London surrenders to mob rule in third night of riots. Surrender! Powerless police let the mob seize the streets, looting shops and starting fires in their wake. London riots: Guerrilla warfare erupts as no one knows where mob will strike next. We begged mob not to torch our homes. 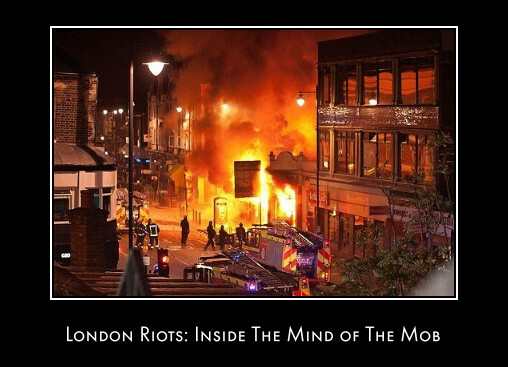 A constant theme to emerge in the reporting of the London riots has been the "mindless" acts of violence, arson and criminality. It's perfectly understandable why this adjective is used so readily within this context. However, by definition, the term mindless implies an absence of mental effort and with it an implicit assumption that no rational explanation exists. For well over a hundred years the discipline of psychology has attempted to explain the nature of crowds and mob consciousness. For instance, the following article was written by Guy Tawney in 1905. According to a well-known view the crowd-mind is a 'disaggregated' personal mind, the ordinary mind of an individual shorn of its sense of responsibility, its reason and its initiative. The crowd-mind is like the hypnotic mind in exposing the suggestibility of a man naked to the influence of those around him. It is said that participation in the life of a crowd has this effect, that a man no longer controls his own thoughts and acts, but carries out more or less automatically the ideas he receives from others. To share the crowd mind is to have less than a whole mind, is to sacrifice for the time being the noble powers of discriminating judgment and reason. This being assumed, the crowd ought to develop the worst side of men and women, and the term has been accordingly restricted by some to those collections of individuals which go to excesses of folly and crime. When this truncated condition is relatively unsteady and transient, we have, according to this view, a crowd-mind, and when relatively steady and permanent, a mob-mind. This study is not written from that point of view. The crowd-mind is a whole mind acting under a group-influence to which man is remarkably susceptible. In the lynching party and the riot, a man solemnly feels that he ought to strike, that it is the only thing to do under the circumstances. Of course there is a mob-consciousness, and the essential truth of its description at the hands of psychologists need not be called in question here; but we believe it to be possible for a man to enter into the life of a crowd without suffering the least loss of personality. If loss of personality meant nothing more than loss of self-consciousness and the powers of mind dependent upon it, the circumstance would not be characteristic of crowd experiences. Everyone, when excited, that is, when intensely and narrowly interested in a single object of thought, loses for the time his consciousness of himself, but why should we say a collection of individuals is never a crowd unless they all thus lose their heads together? Where people meet by accident and not in the carrying out of any one purpose, where they are simply together in time and space without being conscious of sharing any concrete experience, they certainly do not possess the sort of mental unity which constitutes a crowd-mind: and on the other hand, when people are conscious of sharing a concrete and very interesting experience, it matters little whether they are near each other in space or not. The destruction of the Maine so unified the imagination and feeling of the American people as to make the entire nation for the time being a crowd. Where people are by accident in one place and share no concrete purpose, their ideas do not take a common direction, they do not feel and act alike, each goes his own way very much as he would do if there were no one near him. If sufficiently numerous they are still called a crowd in the popular use of the term, but not in psychology. What mental unity they possess is too abstract and conceptual, too far removed from concrete issues and circumstances, to give them what is called a crowd-mind. The question whether a collection of men and women is a psychological crowd is a question whether they share knowingly a single concrete purpose and perceptual experience. On a Sunday morning when people are strolling in groups to the churches on Fifth Avenue, mildly conscious as they pass along that they share the same concrete purpose with the many who precede and follow them, they constitute a crowd just as truly as the same people after they have entered the churches and sit elbow to elbow within sound of the organ and the preacher's voice. We deliberately choose extreme illustrations to bring out the worst side of the theory to be maintained here, namely, its comprehensiveness. There is a lay opinion that the psychological accounts of the crowd are extreme and overdrawn, that in short the crowd-mind is not irrational except where the conditions are such as' would render an individual irrational. Such an opinion fails to do justice to the part played by suggestion whenever people are in a position to influence each other directly, but the opinion is psychologically justified by the one-sided devotion with which mobs have been studied to the neglect of such crowds as gathered at the World's Fair at St. Louis last summer, where people were not excited although profoundly influenced by each other's moods and actions. A classification of crowds is clearly necessary, and it should be remembered that all classification is relative. Nature does not seem to be interested in classes and any one of several classifications is possible whenever we undertake to divide up a group of phenomena. Whether our classifications are true or not depends upon their usefulness to science, that is, upon the degree to which they help us to understand nature. 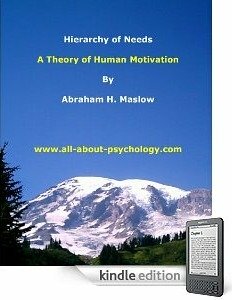 Different collections of individuals differ in two respects which are for the understanding of their psychology very important, namely, they differ in the kinds of experiences they share and in the constancy with which they are conscious of sharing them. A body of young men are conscious of sharing the student-life which they actually make for each other, and a body of citizens are similarly conscious of their civic solidarity; but students are more continuously aware of the unity of their student-life when they are met for a concrete purpose at an intercollegiate foot-ball game than when they sit apart in their rooms, and citizens are more intensely aware of their statehood when carrying on a foreign war than when engaged in the peaceful pursuits of trade and literature. In both cases we have illustrations of two types of social consciousness, the one abstract, conceptual and reflective, the other concrete, perceptual and active, and the two differ as do the society-consciousness and the crowd-consciousness. The social consciousness and the crowd consciousness are alike in being consciousnesses of shared experiences, but they differ as the concrete and particular differs from the normative and abstract. The sense, possessed by all normal human beings, that we exist and work under a common moral obligation, is a consciousness of shared experience; so also is our awareness of certain truths, especially those emphasized by the 'philosophy of common sense.' Truth and duty are shared experiences, but the consciousness of them does not constitute a crowd-mind unless they are invested with the perceptual imagery of the religious imagination. It may be that the heavenly hierarchy and the divine world-drama of the middle ages have largely lost their influence in the present because by criticism and analysis they have been robbed of their suggestiveness for the crowd. In place of all that we have certain abstract conceptions which can never become the basis of a crowd consciousness. It may be that the religion of Christendom has been more largely a crowd phenomenon than we ordinarily think. Such shared experiences as a foot-ball game are concrete and factual; even in anticipation and recollection the game is pictured as an imaginative complex made up of memories of the crowd, the shouting, the field and the struggling teams. In the case of the crowd the shared experience is limited to the crowd, while in a society the experience is universal and normative. Crowd-experience is particular while ordinary social experience is general. The crowd-consciousness is transient while ordinary social consciousness is permanent. Crowd-experience is collective while ordinary social experience is individual. The ordinary social consciousness centers in an ideal which comprehends the highest welfare of all, while the crowd considers only itself and does not wish to be reminded of the wider reaching obligations of man to man the world over. The ordinary social consciousness is a more or less intermittent affair, while the crowd-mind, so long as it lasts, is continuous. It must not be supposed that in shared experiences the consciousness of ourselves and others is always clear and definite. Based upon social instincts which men share with some of the lower animals it is often a 'sense,' a vague idea saturated with feeling and represented in consciousness by a readiness to act as though we were associated with others for weal or woe in what we think and do. One of the most important differences between a crowd and a herd lies in the presence of an idea of the group-experience in the minds of the crowd and the absence of any such idea from the herd. The basis of the herd-mind is feeling and instinctive attitude rather than idea, although even a herd of stampeding cattle must have some vague and rudimentary notion of the intense experiences they share. The members of a crowd are always aware of the crowd with its concrete purpose, its physical bigness and power. It is quite impossible for an ordinary man to feel himself one of a crowd of angels, because it is so out of the question to rub elbows with an angel. In the crowd men are conscious of each other's bodily presence and of certain concrete limitations of time and space and circumstance within which they move. We are now ready to say what a crowd is, namely, a numerous collection of people who face a concrete situation together and are more or less aware of their bodily existence as a group. Their facing the situation together is due to common interests and the existence of common circumstances which give a single direction to their thoughts and actions. Crowds may be classified according to the degree of definiteness and constancy of this consciousness. When it is very definite and constant the crowd may be called homogeneous, and when not so definite and constant, heterogeneous. All mobs belong to the homogeneous class, but not all homogeneous crowds are mobs. A skillful orator makes his audience homogeneous by so stating their problem as to awaken, where it does not already exist, a concrete and lively sense of their common need, thereby rendering his further task of leadership a possible one. Whether a given crowd belong to the one group or to the other may be a debatable question, and the same crowd may imperceptibly pass from one to the other. The two classes of crowds differ in degrees of homogeneity, and we may now add that they differ in deliberateness. In relatively heterogeneous crowds what mental unity exists is to a greater or less extent deliberate: their members share a concrete experience because they continually will to do so. They imitate each other and carry out the suggestions of the time and place, not by blind instinct and impulse, but deliberately and with a sense of self-commitment or self indulgence. In extremely homogeneous crowds, on the other hand, deliberation is lacking, the individual is absorbed in the crowd-purpose and receives direction from a crowd-leader who arises out of the crowd in response to its own demand for leadership. The leader secures the attention of his associates partly because he shares its mental life. He is usually as excited and as lacking in deliberation as they are, and whatever leadership he exercises is really a function of the crowd-mind. In conclusion, the crowd-mind is not a disintegrated personal mind but a whole mind acting under a strong group-influence; the consciousness of a crowd is perceptual, factual and active, while the ordinary social consciousness is conceptual, normative and individual; and crowds may be characterized according to the homogeneity of the individual minds composing them, the mob being at one extreme and the merely casual collection of individuals at the other. The present writer feels that the theory of crowd-psychology can be bettered by adopting some such broad conception of the crowd as is here outlined. 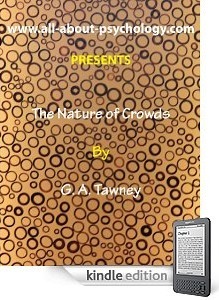 The Nature of Crowds by G. A. Tawney is also available on Kindle. "Nothing is so contemptible as the sentiments of the mob"